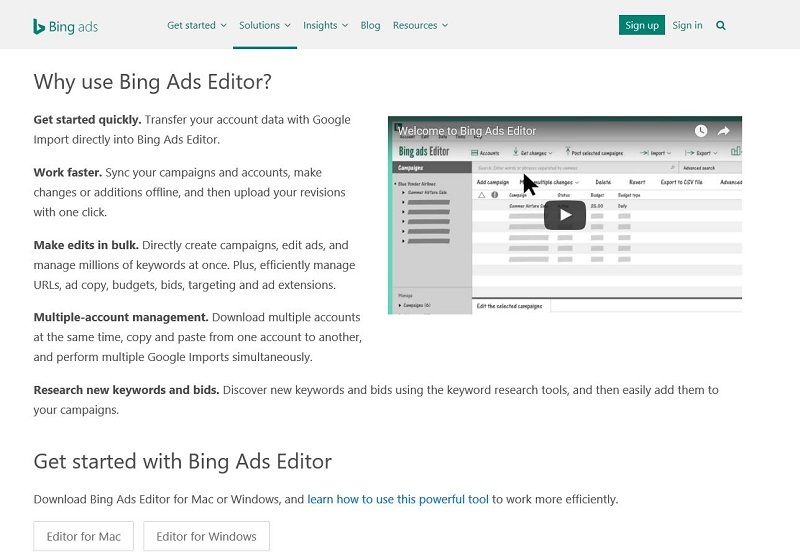 What is Bing Ads Editor? 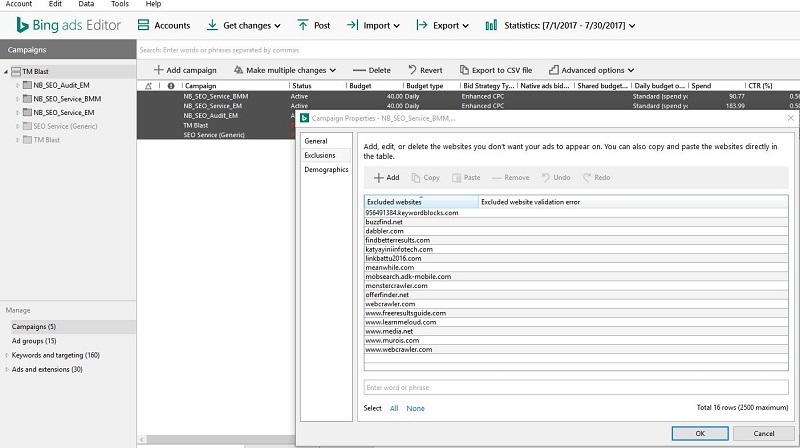 Bing Ads Editor is a tool that allows you to perform a lot of work in Bing Ads through bulk applications. Instead of spending manual hours in the UI making bid changes, adding keywords, changing settings, and more, you just make everything in bulk and just post the changes. 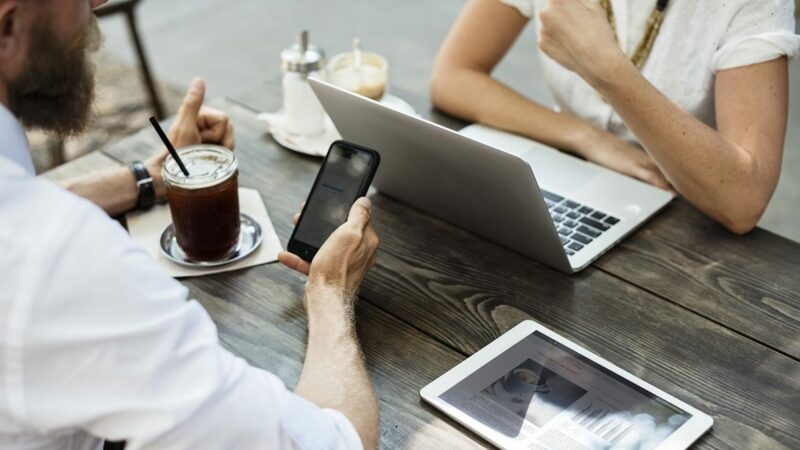 This process allows you to cut down on the manual work that is needed to keep your advertising at top-notch and will limit the amount of human error that comes with many steps. Is Bing Ads Editor Free? How to Use Bing Ads Editor? There are so many things that you can do in Editor. Some of the things that I am going to show are how to get started each time with the editor. How to upload campaigns, ad groups, keywords, and ad copy into the platform. Next, I am going to show how to add website exclusions in bulk to all of your ad groups if you opt into the syndicated network. I’m also going to show how to add negative keywords into all of your campaigns and finally going to explain how to look at statistics right in the tool. Basic is okay if it’s just you in the account and you made a couple of small change like budget changes and pausing some keywords. Primarily if you are working on a large Bing account, you don’t want to spend extra time downloading everything since that will slow you down. This is typically used if you are in the tool every day, so you know you won’t be missing a lot of things. More data is a good option if you have not logged into the tool in a few days or weeks. With all the changes being made in the account, you should then download the more data tab. This will take longer to pull, but you want to make sure you are picking as much information when you are going into the account. Don’t upload any new campaigns, ad groups, keywords, etc. when it comes to the UI with Bing. This is where Editor shines. You can mass upload many campaigns and ad groups with the power of Excel. I’m going to show how to do this precisely in Excel first to then transfer it all to the editor. The way that I have this set up is to have four tabs like this that have all the information for each tab. The tabs that you must have at the top are the campaign, status, and budget. As a note, I would have everything put it as paused if it is a new account so that you can check everything before you go live. My are set to active since my campaigns are currently running. As you can see here, I have one campaign set to active that will have a budget set to 40 dollars a day. If I had more than one, I would then put that campaign’s information in the next row and so on. Taking from the campaign, I am choosing to have two ad groups associated with one campaign. The tabs that you must have at the top are campaign, ad group, and the status. As you can see from above, we continue to build off each tab before it. Still having one campaign and two ad groups, I can then associate the keywords I went into each of those settings. The tabs that you must have at the top are campaign, ad group, status, destination URL, and the match type. As a note, you might see that my destination URL looks somewhat funny with all of that tracking. This is called UTM tracking which allows me to track any clicks to my Bing Ads in Google Analytics and as Bing paid search clicks. You don’t have to do this in AdWords, but you do have to apply this to Bing and any other non-Google property if you want to track everything. Bing has moved to expanded text ads as of 2017, so any ads that you create need to follow this format. Again, you will continue to see that we take all the information from above and apply it to each tab within Excel. The tabs that you need to have at the top are campaign, ad group, title part 1, title part 2, status, text, path 1, path 2, and the final URL. I like to do everything in stages, so I am going to show you how to upload the campaign and you can apply the same process to every other tab that you created. With the campaign tab created, I am going to go to the campaign tab within Editor. From there, I am going to click on the make multiple changes tab so I can paste everything from excel into it. Once you get to that screen above, you need to go back to your campaign tab and copy all of that information. After that is copied, you go back into Editor and you paste all of that information in. Once pasted in, you click save and you just uploaded your first campaign. You can repeat these same steps for each of the tabs like ad groups, keywords, and more. When you pull the website URL report in Bing Ads, you can see what syndicated websites are driving traffic to your site. What you can do from here is gather the list of sites that you want to block in Excel and use editor to bulk exclude sites. I go in a lengthy article about the Bing Syndicated Search Partners and how to be successful, so check that out if you want to see the steps on what to do in the UI and Editor. I also wrote another article around the same topic on why you need to monitor this network on a regular basis. Like any well-paid search campaign, you have to continuously comb through the facts to find the right and wrong keywords for your account. If you have your account set up in a way that is easier for you to see all your campaigns that are not an exact match, you can then apply all negatives in bulk to a shared library. Of course, you should make sure that the keywords make sense to block since you don’t want to prevent a term that actually needs to serve on another keyword. If you run into this, you will run into something that is called a negative keyword conflict. 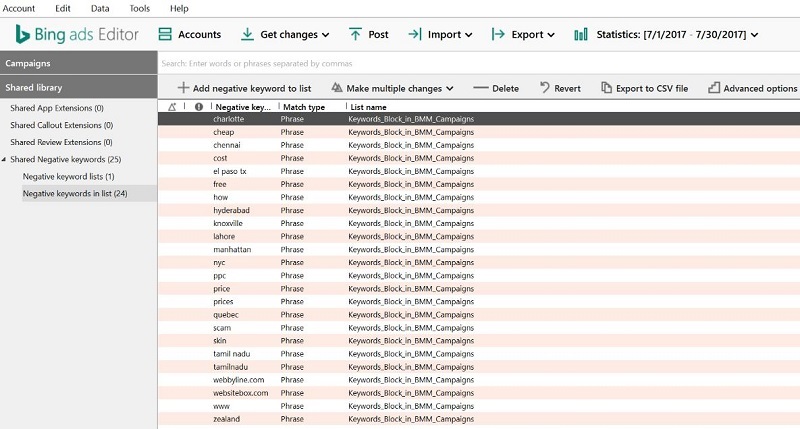 After you pull your search terms report in the UI, you can then add as many negative keywords as you want in bulk to all of your campaigns. Directly navigate to the shared library tab on the bottom left and look for the negative keywords list section. Once you get to that stage, you can click on the add button to put in your terms that you want to block. From there, you will then choose what shared library you want to put the keyword in and then you have to select the match type. As a note, you want to block phrase match terms in a broad match modifier campaign since those are terms that might have triggered your ad in that format. Here is an example of some of the terms I’ve decided to block to all of my broad match modifier campaigns. Another reason to stay in Editor is the ability to get quick looks into the KPI’s that matter most to you. To change the data range, you click right onto the view statistics button at the top of the editor. From there, you can go to the area you want to work on or view and look at the metrics that are there. Here is an example of looking at the ad copy for all of my campaigns. I can then sort by highest click-through rate, or take a look at what is driving in the leads to my site. This type of quick analysis can let me know if I need to make further digging into my account if I start to see something that needs more attention. In this blog post, we went over what Bing Ads Editor was. We went over if it was free and some of the most basic ways to use this tool to be successful. There is still so much that you can do within Editor like place settings, audience applying, site link creations and orders, PLA’s, and so much more. The point is that this tool is going to save you so much time when it comes to advertising.